The so-called “retro movement” not only had architectural implications, but functional ones as well. It is important view these trends as an evolution, not a revolution started by one ballpark, specifically Camden Yards. While Camden is seen as the starting point for the evolution of the “retro ballpark,” New Comiskey Park represented the beginning of the “modern” ballpark building boom. The first baseball-only venue since Kauffman, every ballpark today evolved from New Comiskey, despite seeming extraordinarily antiseptic and unfriendly in retrospect. 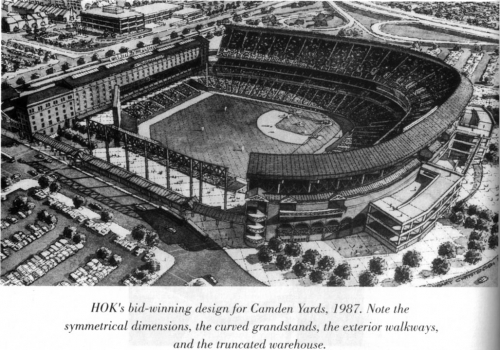 Early Camden Yards rendering by HOK. Note the resemblance of the seating bowl and exterior design to New Comiskey. 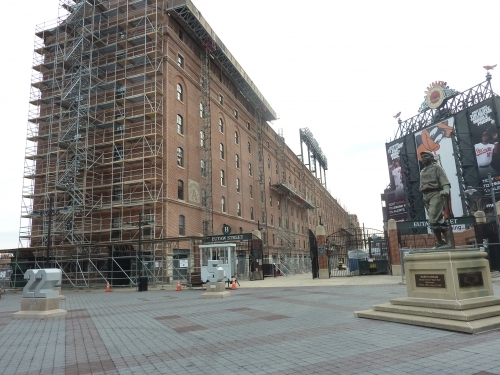 This modern treatment of Camden Yards shows new amenities were driving the boom in construction. The attractive retro architecture was an afterthought. It had arches and a façade, loosely resembling Old Comiskey. So while we could say the retro movement hasn’t been born yet, its sentiments were partially conceived with Comiskey. Its 360-degree open concourses became the standard. Most importantly, its original premium seat model, with a mezzanine club level between two suite levels, was the basic template for future ballparks. In almost everyway, New Comiskey Park was the godfather of our current ballparks. The last point brings an important distinction when comparing and analyzing the evolution of modern ballpark construction. Despite varying from market to market, the common thread between all ballparks constructed during the ballpark boom after 1991 was the emphasis of premium seating. When we see the functional similarities between New Comiskey and the retro ballparks that followed, we see the following “retro movement” as an effect rather than a cause. Luxury suite at Minute Maid Park. The owners’ discovery of the enormous revenue generating potential of premium seating facilitated the ballpark building boom. There was enormous untapped wealth in the pockets of businesses and well-to-do sports fans. Franchises pushed local governments into subsidizing new ballparks primarily because of premium seating. Teams that got these new facilities were at a tremendous competitive advantage, able to greatly increase payroll. The entire premise of these ballparks was the necessity to build luxury boxes and modern amenities to satisfy the demand of the growing economy and boost revenue. The look of the ballpark was important, but strictly secondary. Baltimore realized that these cold revenue-boosting stadiums could be wrapped in a warm, retro façade. Camden figured out that the nostalgic look of red brick and exposed steel matched the prevailing architectural ethos of post Cold War America. But the new premium-seating model was the primary reason for the construction of these modern ballparks (especially look at Jacobs Field). While rendering New Comiskey obsolete in many fashions, New Comiskey was the trendsetter because everything is based on economics. There’s a reason why it didn’t have to be replaced. Camden Yards is rightly seen as the trendsetter in ballpark neoclassical architecture. Since people focus on aesthetics, it is seen as the overall trendsetter in modern ballpark construction. But Camden did much more than just start a revolution in architecture. The Orioles started a culinary revolution at the ballpark, as their concessions had a certain regional flair, as seen by the crab cakes and Boog’s BBQ. The upper decks were slightly more cantilevered over the field, providing a middle ground between New Comiskey and the Jewel Box parks. 2012 renovations to Eutaw Street. With its red brick façade, intimate exterior landscaping, and nostalgic interior imagery, Camden Yards was the pioneer in retro parks. It provided small, but significant fan friendly features, such as standing room only areas that were refined by future ballparks. But most importantly, Camden Yards recognized that every great ballpark’s identity is rooted in its context. It was the first to be integrated into a downtown setting, making it a fabric of the community. Every succeeding ballpark added a piece to the puzzle of the current standard for new ballparks, despite your normative judgments on a particular trend or feature. Coors Field was the first retro ballpark to have open concourses, leading to particularly high acclaim. The evolution of the modern ballpark has been characterized by an increasing emphasis on encouraging fans to leave their seats and explore the ballpark. HOK (Populous) invented the term “third inning stroll,” where fans walk around the park to see all of the attractions. 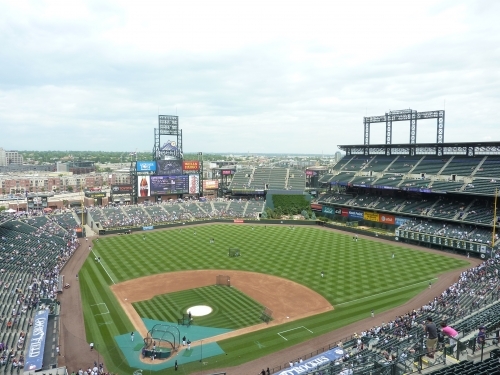 Coors Field functionally refined the retro ballpark. 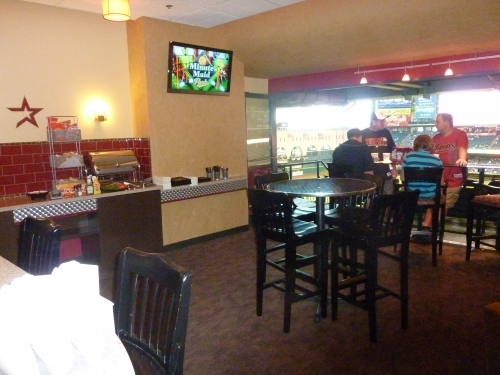 Fans can see the game from a multitude of vantage points while buying concessions and seeking out other amenities. So it also makes economic sense as well. In recent years, especially with Safeco Field and Citizens Bank Park, there has been an increased emphasis on outfield standing room areas. Turner Field was the first venue to integrate significant entertainment areas inside the ballpark, contributing to the so-called mall/carnival feel of succeeding ballparks. This “mallparkification” has been met with some controversy from purists. Prior parks, such as Camden Yards, Jacobs Field, and Coors Field, had very small playground areas. 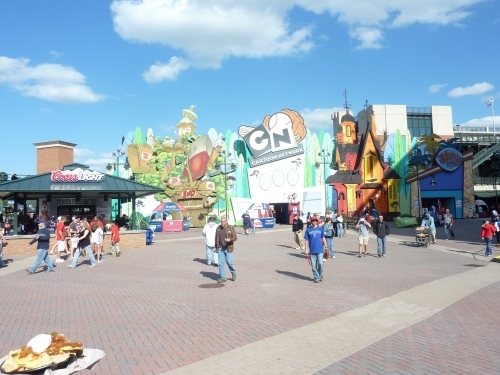 But after Turner Field, we saw multiple parks go all out with the entertainment features or kid related areas, such as Miller Park, Comerica Park, Great American Ballpark, and especially renovated Kauffman Stadium. The “carnival” at Turner Field. Notwithstanding the economic downturn in late 2008, premium seating has gradually progressed. Luxury boxes were traditionally the priority, as seen in The Ballpark in Arlington and Jacobs Field. Throughout the new millennium, we began to see a decreased emphasis on luxury boxes and membership club restaurants, with an increased emphasis on club seating. Safeco Field and Minute Maid Park opened with a small, exclusive ultra-premium seating sections behind home plate to satisfy a new market during the dot com boom (renovated 1998 Angel Stadium had a similar version). This has been copied by every ballpark since 2001, while parks like Coors and Turner retroactively added premium areas. Since 1991, there has been a consistent and continuous downward trend in the number of luxury suites included in the ballpark, with an increased emphasis on “club seating.” We saw new parks in Cincinnati, Washington, New York, and Miami include three or more premium clubs. Comerica Park pioneered a particularly important feature that would be included in many parks throughout the new millennium. A gap in the grandstand down the lines, which breaks up the monotony of seats, was done for mainly functional reasons, but also sometimes for aesthetic reasons. In Detroit, the upper deck was brought closer to the action where the luxury boxes ended down the line, hence the need to break up the grandstand. It could also be rationalized as a historical nod to the fragmented Griffith Stadium. 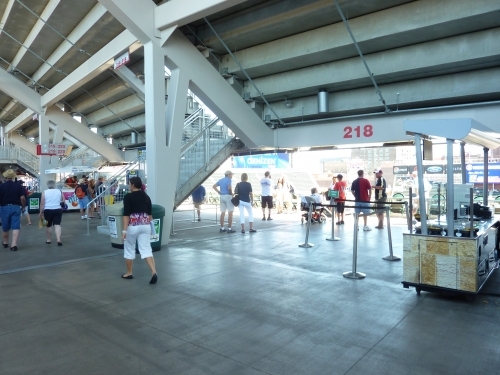 Citizens Bank Park brought perhaps the most important and lasting functional innovation to modern ballparks: an open concourse throughout the upper deck. By splitting the upper seating structure, fans can enjoy a concourse open to the field. PNC Park and Petco Park were the first to boldly deviate from the kelly green seat, red brick formula, recognizing that ballpark architecture is about context. Open upper deck concourse at Target Field. While most new ballparks bring minor innovations to the table, these are the ballparks that generally provided lasting staples in modern ballpark construction. As I discuss later, there has been a lack of innovation in the most recent retro parks built after 2006. As we can see, it is not solely the innovations brought by Camden Yards, but rather a progression and a continuum of ideas that determined the current standard. Of course, critics are claiming Marlins Park is starting a new paradigm in 2012, which is true superficially, but also somewhat true in substance. I’ll discuss this at some other time.